After hearing the superlatives from Matt and later again in almost perfect unison from other nearby hosta friends, Bill Meyer, Carol Brashear, and Kathie Sisson, my expectations were raised, even peaked about getting to this Traver marvel they spoke so highly of. On finally arriving one late summer day, I found the garden tucked in a neighborhood near the top of a winding wooded road. Ed Traver introduced himself and led me through the gate and into a lawn with grassy fairways running among the massive borders of the garden. 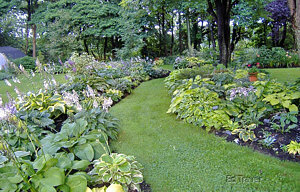 The sight was absolutely brimming with mature hostas of every description. “Where to begin?”, I asked with some bewilderment…be clear, this was excited bewilderment as I zoomed in on classic after classic, like his well grown H. ‘Yellow River’ specimen or H. ‘Stingray’, then rarity after rarity like ‘Reflected Glory’ or ‘Simply Sharon’. Immediately, I knew the Traver garden would be an inspiration garden for folks across hostadom. The garden is spacious with wide lawns and massive borders creatively combined to quickly sweep the visitor from reality into another world. 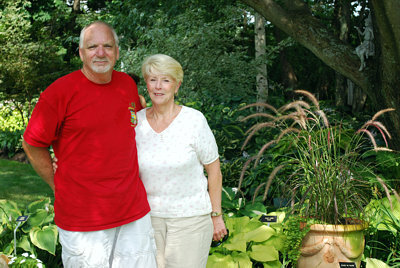 Ed and Pat Traver have gardened in Wolcott for several years, but hostas have really only made their inroads over the past 10 years or so. 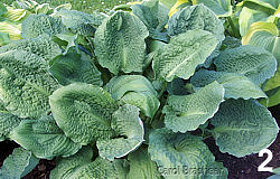 Ed focuses on hostas and Pat tries to keep him in check by adding other elements of garden design as well as a nice mix of perennials and annuals. Occasionally Ed has to be persuaded that there are a few other ornamental plant species that also belong in a fine garden. 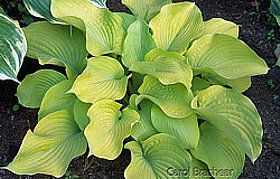 Together, they have amassed some 1450 hostas, many OS cultivars, and have named varieties uncommon and rare filling up beds like good soldiers in a garrison. Ironically, many of these fine soldiers would be focal specimen plants in more typical hosta gardens. I found myself as a bumblebee inspecting each and every plant he sees, and was captured and just gawked saying, “so that is what Mildred Seaver’s hosta, ‘Split Personality’ looks like”. I had never seen this many well grown mature hostas in one setting and after gazing and engrossing myself in the magic show, I thought, where is this Mary Chastain collection I have been hearing about? I did not need to ask as it was the expansive well developed border I had passed on the right while looking at the best place to start to be sure not to miss anything. I quickly came to realize that anyone with any eyesight remaining at all would have known, but forget that - I was amazed. I had not seen many of Mary’s plants and to get to see so many, some 135 all at once, made me feel as if there was another entire set of species and cultivars that had been discovered…right there in the Travers' Wolcott garden. 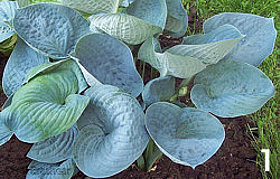 My hosta need list was quickly pulled out and lots of notes were going in starting with 'Lakeside Color Blue'  which exhibited strong blue very late in summer. I found it hard to believe just how blue it remained when almost all the other great blues had settled into their late-season green attire. After seeing one new-to-me cultivar after the next, I was amazed to see his clump of ‘Lakeside Prophecy’ . Seeing this one plant made my day, yet again and I think singularly would have made the trip worthwhile. I saw a large well- proportioned mound of perfectly spaced heavily- substanced leaves. They were incredibly "nubbled" (which of course is an old yuppie term for a rugose blend of wrinkled, crinkled, and pebbled leaf surfaces), but in a uniform way which when combined with the symmetry of the rest of the plant was inspiring to see. To say it looked like a very large perfectly executed sculpture in deep green vinyl chloride would make most of us turn away and say what have they done to my favorite plant species now? So my words cannot describe nor my camera depict the absolute stunning beauty of this Lakeside cultivar. 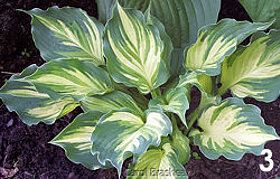 As many of you know, I am a big fan of streakers and this one is what we streaker nerds affectionately or sometimes derisively call a greenie…but Ed Traver’s ‘Lakeside Prophecy’ is my personal favorite hosta (at this writing) that I have ever seen. 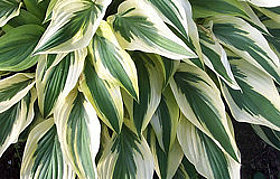 Ed has some real Lakeside rarities including a strikingly bold yellow, ‘Lakeside Cool Cat’, and the stately upright green ‘Lakeside Khum Kaw’ just start the list of outstanding and rare Lakeside hostas in the collection. Ed continues to add when he can and most recently added a rare OS ‘Lakeside Paisley Print’  and ‘Lakeside Banana Bay’. 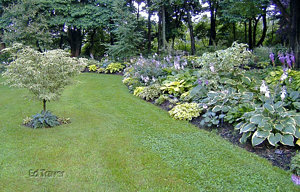 I see Ed and Pat’s garden in rarified company, not unlike that of the Marines’ slogan, “The Few, the Proud” with few other gardens having amassed such a fine collection of classic hostas. And while neither Ed nor Pat exhibit an ounce of arrogance, their garden is something to behold and I certainly put it into the category of “The Proud”. Every year Ed and Pat try to add plant material and elements of design. Ed is currently adding a path that now meanders in his garden with origins in local history. The dark bricks he salvages from the Naugatuck River have rounded edges, worn smooth by sheer force of water. These pavers are remains of buildings destroyed over fifty years ago in a devastating flood that rampaged through Waterbury in 1955. The havoc that is still in the minds of old time Waterbury residents now, in one small way, has a fresh and meaningful re-purposing as treads in the new Traver garden path. 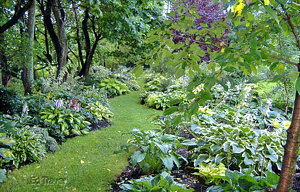 Like Matt Sanford, I am now urging others including you… ”You’ve got to see Ed’s garden…you won’t believe the numbers of mature specimen hostas …and just wait until you see his collection of Mary Chastain plants.” It is worth the train, bus, plane, or car to see this marvelous space that has been lovingly pulled together by Pat and Ed…what a treasure to find tucked away in the wooded Wolcott hills!